Egberto Willies is a political activist, author, business owner, software developer, web designer, and mechanical engineer in Kingwood, TX. Egberto is an ardent Liberal that believes tolerance is essential. His favorite phrase is “political involvement should be a requirement for citizenship”. He believes that we must get away from the current policies that reward those who simply move money/capital and produce nothing tangible for our society. If a change in policy does not occur, America will be no different than many oligarchic societies where a few are able to accumulate wealth while the rest are left out because it is mathematically impossible to catch up. Egberto is: Author of “As I See It: Class Warfare The Only Resort To Right Wing Doom”. President of the Kingwood Area Democrats Harris County Democratic Party Communication Committee Chairman Texas Precinct 758 Chair Board of Director of Coffee Party USA Board Of Director of BeYourGoverment Member of Move To Amend (MTA) Coalition Executive Committee CNN iReporter with over a million page views. 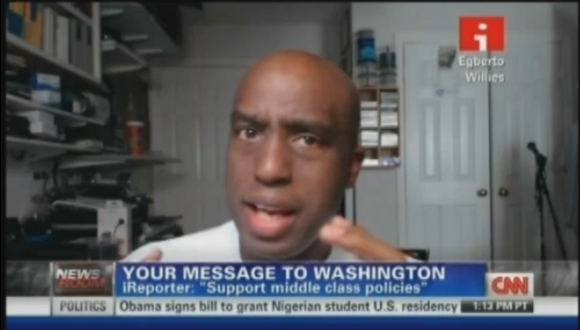 I did a CNN iReport a couple of days ago on the politicians and the fiscal cliff. It got picked up and played today on CNN. The video is below. It can be proven that a strong middle class and equal access to the middle class created a vibrant economy. As such policies that support a strong middle class is essential for the country’s survival. If one itemizes policies that are helpful to the middle class and policies that hurt them and said policies fall with a particular party, I believe the media would be derelict in its duty not to point that out. Just as a recent example, I posted this blog post that illustrated that. Is it a left or partisan post? NO. It is a factual post. Both parties, well, all parties would do their jobs if the population were informed and could really make an informed decision. That would force the politicians to stop acting like children and govern.